1- How Do You Clean Your Stamps?? How Do You Clean Your Stamps?? From: Mickey Jo --- I use a tiny tupperware container and a sponge I wet with water. I just clean it off on there, then dry it off on the little cleaner pads that have the little bristels to them. This gets in between all the little nooks and crannys and dries and cleans them out. From: Anita L---- I clean mine with a commercial stamp cleaner. My bottle has the sponge on the top and I scrub the stamp with it. Then I rub them across a stamp cleaning pad to dry and make sure they're clean. I bought a bunch of the cleaner when a local store had 40% off all stamps and supplies, so I got it pretty cheap. I don't know what I'll do when my supply runs out and I have to pay full price for it :)! 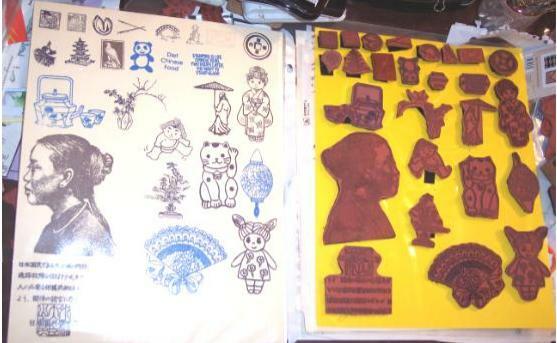 From: Kelly ---When I stamp, I keep the an old meat tray or something like it on my stamp table. What I do is put a wad of damp/wet paper towels in it, and as I stamp, I "stamp" on the wet paper towels to get my stamp clean. WORKS GREAT and it's easy, and FREE to boot. Then I keep a folded dishtowel or something like it on my table too, and put my cleaned stamps on to dry. Very simple. Took longer to semi-explain than it does to do! after I use it. Works pretty well for me. From: Tori ----Maria ~ That is exactly what I do minus the kiss off! I have lots of those travel containers that huggies come in and I just keep one filled up with my stamping stuff. From: Linda H ---- Since most of mine are unmouted, I don't have to worry about the wood. I use the baby wipes without alcohol and Lanolin. ***IMPORTANT, don't use lanolin or petrolium products on rubbber, it will ruin them. ***They clean up really good. If I do use a cleaner on them, I use Simple Green. Not only is it pretty earth friendly (Linda the Vegetarian/Tree Hugger) it is cheap and will not harm the rubber. I actually contacted the company and asked them, and they said it was fine to use on rubber/latex products. (NEW POST) Simple Green is a environmentally safe cleaning agent that you can get at stores like Walmart, grocery stores or home depot type stores.....I got the idea from our local stamp store so OF COURSE it is perfectly safe....AND CHEAP! From: Diane ---- I use the baby wipes that have no alcohol or any additives. I just press the stamp into the pile (I leave them in the container and just remove it when it gets too dirty) then rub it on to one of those pads that you use for trimming when you paint. (It has many little "fingers" that clean the stamp). You don't have to worry about the wood warping or anything. From: Jerri ----Most of my stamps look pretty good, but the ones I use the dye inks with a lot look awful. I have heard you can use Skin So Soft from Avon to clean them.....have not tried it yet. I started out with all pigment inks, so this is a problem for me. From: Dee ---- I have one of those stamp scrubber pads. So I put water on it and a drop of dish detergent. Then I rub my stamp across it and dry with a paper towel. From: Mickey Jo ---Doesn't soap hurt stamps?? I thought you were not suppose to use detergents??? Hurry inquiring minds want to know! How Do You Store Your Stamps ?? How Do you Store Your Wood Mounted Stamps? From: "Sandy "---Hi Everyone, I have the 6 drawer Iris carts and have them in there. They are in drawers in neat order at the moment by category so I can find something very easy. I imagine that sooner or later, that won't work as I'll run out of room and will have to do something different. From: Ginny ---I keep mine in a Iris cart, and my unmounted are in a book binder with the halo system. From: "Cassey W." ---Hi everyone, For my wood mounted stamps, I have 2 of the 3 drawer sterlite thingys. These drawers are deep enough to hold two layers of stamps. Although my goal is to get another set of drawers so I can just have one layer in each drawer, so I don't have to pick up one layer to see what is underneath. My mom has all her stamps like this and I love it. Actually I probably need a couple more sets of the drawers, cause I have a basket full of stamps that I didn't have room for. From: Tori W.---Ok, I use a Highsmith corregated organizer to store my stamp supplies in. It is great! I have a 2 drawers for stamps, one for ink pads, one for ep's, gun, stylus, etc.., one for fragile papers & stuff, and one for odds and ends. I just love this thing. I have one for my scrapbook stuff too but I also have a ton of other things that my scrapbook stuff is in also. >From Holly T.---- I HATE to put anything away..............it is soooo much easier just to have it out in the open. I bet you can guess how my whole house looks!!! From: Dee--- OMG Holly -- a woman after my own heart!!! LOL I have 2 full 8-drawer Iris carts with stamping supplies in them. Two large tupperware storage bins (from the hardware dept) that I keep my small stamps in (labeled too, I might add) and a big square plastic container to keep my large stamps in. Unfortunately (?) I have too many stamps. They don't fit. Therefore, they are stitting all over my stamping table(s), on top of my containers, in drawers, some fell on the floor ... well, you get the general idea. In other words, all over. And yes, the rest of my house looks the same. Oh well. Mine are all over the place. LOL I bought a large plastic bin but it's full. I have about 10 smaller rubber bins and they're all full too. The rest are sitting all over my stamping desks. From: Joellen A---I don't have a uniques way yet..
From: "Jerri" --- I have a big plastic bin that is actually a drawer. It is so full, that it no longer closes :( I try to stand them on their sides, but they always fall when I am rummaging around to find something. From: Mickey Jo ---Ok, Most of them are SU and lined neatly on a shelf in there own little cases. The others are in drawers flat ones, or in pizza boxes. Just adopted a new sort of box last week. Umm the patties frozen soy bean ones. grin. Box is great. Then I stamp up a piece of CS with what is inside. go to the appropriate index and see what stamps I have to relate to her. I can also look up what saying I need if it's her birthday or to cheer her up. Sometimes I make cards requested by a friend and I can let them see what stamps I have and they can choose their own. That was a little off but it sure helps me to be organized. From: Catrina K. -<-- So far, some neat ideas have been posted. I unfortunately don't have much room in the corner of my dining room so I have a 6 drawer iris cart that I use. Most are stacked 2 deep but the blocks my dh made are skinny enough to get 3 deep. They are organized in the drawers by category (for the most part, until the kids get thru with them). I have all of my stamps index in a binder so I can quick glance thru that for what I want, then go to the drawer. From: "Anita L" ---- I store mine in Iris carts, but I need a new system. I'm outgrowing the carts and need more space! How do you store your unmounted stamps? >From Dee---I don't yet. But I'm going to stamp them first on large brown envelopes and then keep them in yet another rubber bin. Love, Dee M.
From: Joellen A---I stamp my um's onto a piece of printer paper then I put that paper into a page saver then I use Aleene's Tack It Over and Over glue on my um's so they are sticky and I stick them onto the outside of the page saver either on top of the stamped copy or beside it. Then they are put into a 3 ring binder. I use both sides so they are heavier. From: "Jerri" --- My unmounted are in a couple of ziplock bags...one for Christmas images and one for everything else. I am SOOOOOOOO organiuzed. From: "Maria P" -- As for my um's, I keep them in a zip lock bag in one of the Iris cabinet drawers. You can tell I buy a lot of um's. From: Mickey Jo --- Well they have been in tons of little baggies all over the place. Then I got organized and put them ALLL in a cute little container. Well Ummm my container is now full. I need another storage type idea. Am thinking of either base ball card pages, or 6 x 9 white envies. insert.........well I did neither...grin...I put all my UM's in (5) 3 inch white binders. I use clear pages, white card stock and hook velcro. I stamp the image onto the white cs, then slide it into the clear vinyl page, then put a piece of hook part of velcro to left, right or below the stamped image. And place my UM on it. I make sure that NONE of my stamped images are covered. So I do this little by little or line by line. And then on the end of the binders, I write what is in them, a sort of index. Makes for FAST finding of a particular image. Look at pic below. From:Catrina K.-->- divided by categories in baggies. From: "Anita L" ---- I don't have any UMs, so don't need to store them.